Ranging from ...: The Lions are coming! Wow, it has been a while since our last blog post...but we've got some great news! 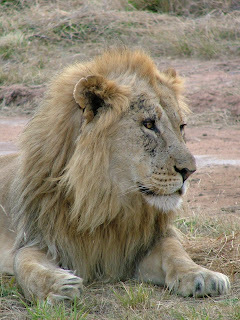 Zululand Rhino Reserve, the reserve that Rhino River Lodge is situated in, has finally procured a small pride of Lions. We've been planning and arranging for nearly a year for the introduction of the "King of the Jungle" and the perfect pride has now been found. The introduction is planned for the end of March 2011. Historically, lions were found here and over 100 years ago the last lion was shot. The game that we keep here on the reserve are all animals that are indigenous to the area, or were once indigenous but because of man have been eradicated from the area. The lion introduction goes according to the plan of restocking game species that were once found in the area. The lions will be released into a boma where the aim will be for them to bond and form a cohesive pride, before being let out after approximately 6 weeks. The pride we're getting consists of 5 animals altogether: 2 males who have bonded and have a good solid hunting coalition and 3 females who are unrelated. The boma period for them will mean that the females will get to know each other and the males will get to know the females. It also gives us time to access the animals for any illness or disease that they might have contracted. They will also be fitted with collars for a short period of time in order for us to locate the animals and track their movements while they get used to the reserve and find their way around. The lions will also be able to assist in keeping our game numbers down. Normally we would have to take off animals in live sales in order to protect our vegetation from over-grazing and soil erosion, but now with a big predator like lion, this will be taken care of and a natural balance can be once again restored. Very exciting times here at Rhino River, where we can officially be known as a Big 5 reserve! Another very unusual happening here at in the reserve, is the precautions we are all taking against the outbreak of Foot-and mouth disease in northern KZN. Whilst we have not been directly affected, this disease is so highly contagious that we need to do everything we can in order to keep our animals safe. The disease affects cloven-hoofed animals like Buffalo, antelope and occasionally animals like elephants can be infected too. The disease consists of blisters which form on the mouth and feet which can cause lameness. This disease is completely harmless to humans, although we are a carrier for the virus to spread. Control measures that we've put in place are security stations at the reserve entrance, where the guards will simply spray your vehicles tyres with disinfectant, and you will be asked to step on a damp mat with your shoes. Nothing to be alarmed about and a little on the exciting side too! All our guests have been fantastic with their co-operation! Go to: http://www.earthhour.org/ to find out more about this great way to unite against climate change, and in recognition for all those who were affected in Japan by the earthquake. It will be happening at 20:30pm, and all that you have to do is turn off all your lights for an hour.